Ryan Dungey came from Minnesota. So did the late, great World Champion Donny Schmit. The Millville, Minnesota-based Martin brothers also hail for the land of 10,000 Lakes. And so does Mitchell Oldenburg. Straight out of Staples, Minnesota (population 2,981), Oldenburg, aged 24, will make a run at the 2019 250SX East Region title beginning Saturday night inside U.S. Bank Stadium. This will be much more than a home race for the man known to his peers as “Freckle.” Oldenburg has shown the speed to contend in 250SX, but he has now been out of action for more than 10 months due to a flurry of beleaguering injuries. Racer X spoke to the Monster Energy/Yamalube/Star Racing Yamaha rider to get his thoughts on the new season and more. 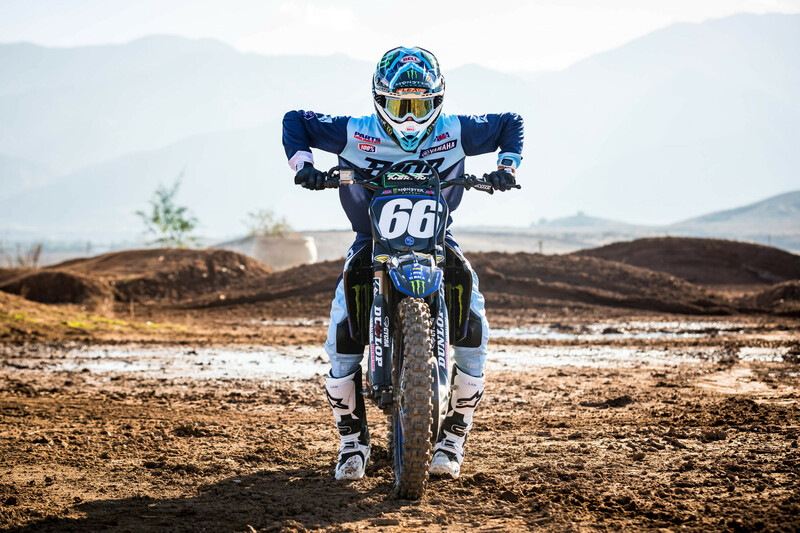 Racer X: Mitchell, how did you end up switching to Yamaha last year? Mitchell Oldenburg: Well, basically, I had gotten some podiums with KTM in ’17, but they had a new amateur coming up and had already had guys signed to the team. There was really no room for them to keep me. Nothing bad happened. We were on good terms. There was just no room and there was nothing anyone could have done. From there, I ended up signing a letter of intent with Husqvarna, but it just didn’t work out between us. Then I thought of Wil Hahn. I’ve known Wil for 10 years now and I’m really good friends with him. I just called Wil up and I knew he was going to be straight-forward with me and I said, “Do you guys still have any room?” Wil talked to Bobby [Regan] and Bobby said, “Yep. We’ll take him, but he’s got to sign right now.” It was a stressful situation. It’s good it is in the past, but I’m really just fortunate that Bobby was 100 percent on board with having me. And then there were all the injuries you had to hobble through with in both 2017 and 2018. That two-year period had to be tough. Yeah, I broke my collarbone at San Diego early in ’17 and I wanted to take all of outdoors off to let it heal. Then at Phoenix in 2018, I crashed in practice and broke it in two spots and didn’t even know it. I was getting all this pain in my arm. I ended up going to Dr. Ting and he basically fixed me up and my collarbone is now plated from end-to-end. I’m 99 percent sure that it is rock solid. I haven’t had any issues since. 2018 wasn’t a total loss, though, eh? You went 6-6-5 in three rounds 250SX West races before being sent to the sidelines again later that spring. All things considered, how did you feel while at speed at those three races? I felt really good and strong, but my starts were terrible. I could catch up to them at Anaheim 1, but I couldn’t pass them and I would just run out of time. My fitness was good, everything was good. At Houston I got sixth. I honestly felt like I was a podium guy that night. I basically saw third right in front of me and fell with just a few laps to go. Yeah, the first three races went good, but Phoenix was the next weekend and that’s when I went out and broke my collarbone. I didn’t know my collarbone was broken and I tried racing Oakland and that didn’t go well. The Monday after Oakland I figured out my collarbone was broken and I went into surgery. Not long after that I raced in Seattle and in the mud and that was alright as I finished sixth. I was okay with that. The Monday after Seattle I was doing laps and I had a lap and a half left in my day and I tipped over in a corner and stuck my leg out wrong and blew my knee apart. I tore my ACL and MCL. I hadn’t done anything to my knee before, so I was kind of in denial right away. That whole deal was rough. Was it tough being out of action and watching the world go by without you? At first I was, but honestly, I needed it because I needed to get my head straight. I was super-negative that last year with a lot of things such as my results. They were decent, but I knew that I was better than that. The injuries really set you back in 2018. Did you ever feel like just letting it all go? No, not really giving up. Yeah… I just knew I had to get my head straight. That was really bad for me last year. It’s amazing how badly negative thoughts can affect you. The week after surgery, my wife went on Amazon and bought me some motivation books and comeback books and stuff like that. I read a couple of them and it helped a lot. From there I shifted my focus to being as strong as I could possibly be off the bike, so when I got back on the bike I’d be starting at a higher level. Honestly, I had a really, really fun summer and really got into mountain biking a lot. When did you get back on the bike? Not until the first week of last September. I had four and a half months off the bike and basically I just trained and did mountain bike races. That was my racing for the summer out here in California. I had a blast with that. Six weeks after surgery I was able to get on a road bike, and three weeks after that I was able to get on a mountain bike. That’s what I did all summer. Then I got back on the motorcycle the Tuesday after the outdoors ended. You haven’t lined up behind a starting gate to race in nearly 10 months. Come Saturday night, are you ready to roll? Oh, I’m ready to go. I’m excited. I think it’s going to be good. I think that last two or three weeks now, I’ve rode the best I ever have. I’m feeling really strong. What’s the plan and what’s in your mind’s eye for Minneapolis? To just focus on myself. I want to do what I can do and kind of set my goals as the day goes on. Through practice, if we’re on the board or in the top five, maybe we’ll shoot for a podium. If we’re qualifying fastest, then the goal is to win. Obviously, the goal is always to win, but we need to be realistic with it all too. Not racing for the last 10 months…. Is that going to be weird for you? I think there is definitely going to be a lot of nerves, but I’ve been working hard with preparation, mentally, and physically and all that, so I’m feeling a lot better about it. I think if I go there and ride like I know how to and everything, if I do exactly what I’m capable of, I don’t see why I can’t win.